Marathon County Health Department works to protect and improve the health of our local communities. 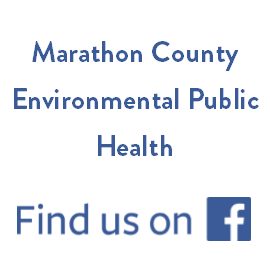 Use the menus on the left side to find information about the services provided by Marathon County Health Department. Call 715-261-1900 if you have questions or would like additional information. Health Department Hours: Monday-Friday, 8:00 a.m. - 4:30 p.m.
Online payment can now be accepted. Click the online payment button below to see which fees can be paid online, and to make a payment. Water in your basement? Questions about mold and clean up? When should I get my private well tested? Click here to find out more about our Start Right program. Need to check your immunization records?Click one of the links below to access the Wisconsin Immunization Registry. List of Reportable Diseases. To report a communicable disease, please call 715-261-1900. If a call is placed after hours or on a holiday, a phone number will be provided to contact the on-call manager.